Crestron has announced a new 7.1 AV Receiver, the HD-XSPA. It is designed to be the "brains" of 7.1 4K-based AV system and features plenty of input and output ports as well as the "full performance of a Class D power amp". In addition it can provide a 2-channel downmix of any content in order to feed a whole-home audio system. The HD-XSPA delivers professional surround performance in a space-saving design for the ultimate audio experience in any room in the home. 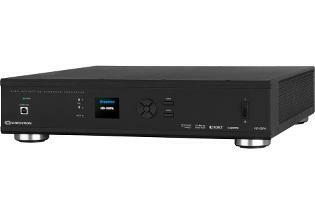 Rockleigh, NJ, March 4, 2014 - Crestron announced today that the new HD-XSPA, a powerful surround sound processor, multi-channel amplifier, and DigitalMedia (DM®) room box in one, is now shipping. The HD-XSPA makes it easy to enjoy spectacular, full-bodied 7.1 audio in a room as part of an integrated whole-house 4K AV system. The HD-XSPA connects directly to a DM switch, eliminating the need for a separate DigitalMedia receiver in the room. A full range of built-in control ports, including RS-232, IR, Ethernet, and relay, allows for programmable control of local devices. CEC pass-through allows control of many devices via HDMI®. "In designing the HD-XSPA, we've made life easier for integrators," said Dennis Fink, Technology Manager for audio products at Crestron. "Until today, they were forced to install both an AVR and a DM roombox in each room. Now they can deliver amazing 7.1 audio, with the full performance of a Class D power amp, with one compact component." The HD-XSPA fully supports 4K Ultra HD sources and displays through 4 HDMI inputs, the DigitalMedia input, and the HDMI output, so it works flawlessly as part of a Crestron DigitalMedia distribution network. It decodes all the latest digital surround formats, including Dolby® TrueHD and DTS-HD Master Audio™; and full input connectivity is provided for all types of digital and analog sources, including Blu-ray Disc® players, HDTV receivers, game consoles, computers, and media servers. Featuring a high-power, 8-channel amplifier, the HD-XSPA delivers professional-grade performance (140 Watts per channel @ 8 Ohms; 240 Watts at 4 Ohms). It includes a powered sub-channel, making it easy to install an in-wall subwoofer (such as a Crestron ASPIRE® IWS82) without impacting living space. Compact in design at just 2U, the HD-XSPA saves space in the equipment rack and integrates easily with other Crestron systems and AV equipment. In addition to providing spectacular 7.1 surround sound, the HD-XSPA simultaneously provides a 2-channel stereo downmix to feed to a whole-house audio distribution system. Homeowners can now hear all the action from the big game anywhere in the home--not just rooms with surround sound. In addition, two channels of the integrated power amp can be allocated for a downmix stereo feed to an adjacent space, like a bathroom or patio, leaving 5.1 for the main zone.